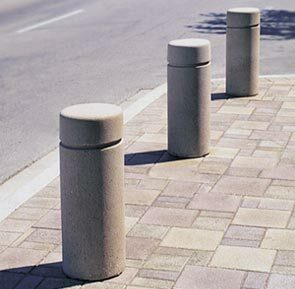 A great fit with any outdoor theme, these concrete bollards provide a high-level protection against vehicle impacts. Commonly used in front of entranceways to provide force protection, these bollards are also often installed to delineate safe passage in and around tricky traffic intersections. The ASTM compliant concrete construction reinforced with steel rebar is ready for long term service. Available in popular standard and premium finishes to balance with any outdoor theme.